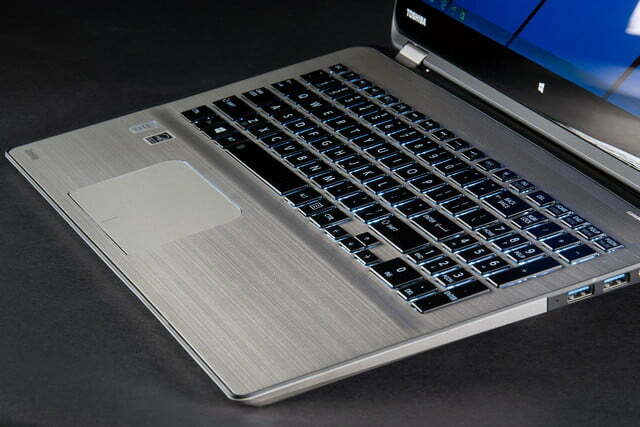 Toshiba’s latest has a fast processor, big keyboard, and good speakers. These positives are weighed down by a slow hard drive, and bulk. 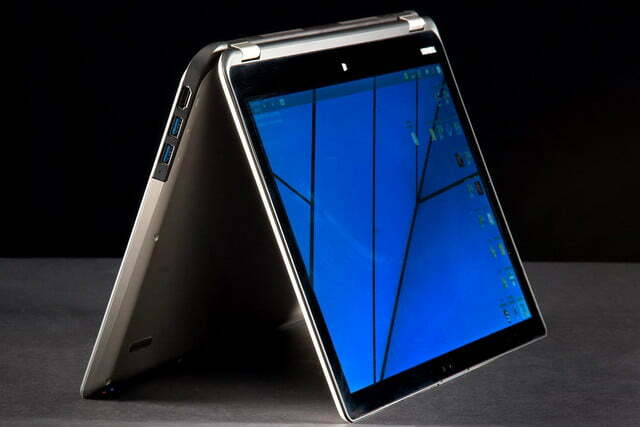 The 2-in-1 is an idea with great promise, but it also faces many problems. 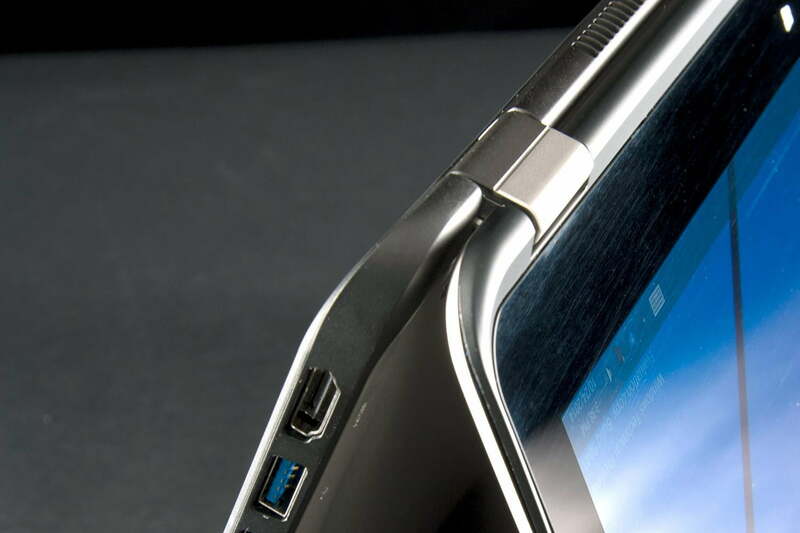 How, exactly, does a company engineer a device that’s great as both a tablet and a laptop? How big should it be? How much hardware should it pack? What should it cost? Many of the best systems in this category address the above questions with answers that are rooted in compromise. They stuff modest processors in mid-size 11- to 13-inch packages, and aim for prices between $400 and $800. Acer’s Aspire Switch 10 is a great example of how balance can result in a quality 2-in-1 notebook. 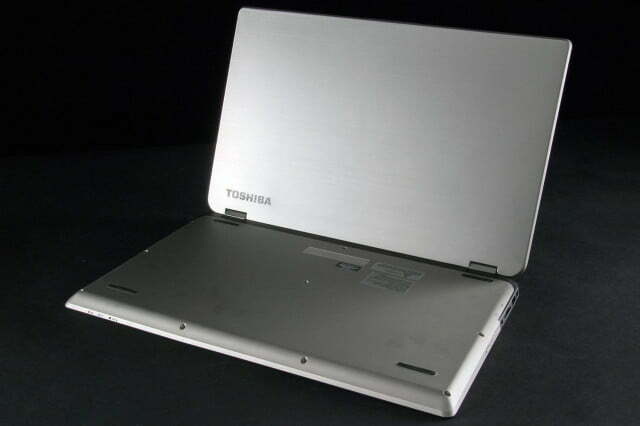 But there are other ways to approach the problem, and Toshiba’s Satellite Radius P55W-B5224 offers an extreme alternative. The result is a massive 15.6-inch convertible with a powerful Core i7 processor, 8GB of RAM, and a keyboard so spacious that it has room for a numpad. While this sounds appealing, refusing to compromise creates a whole new set of problems. 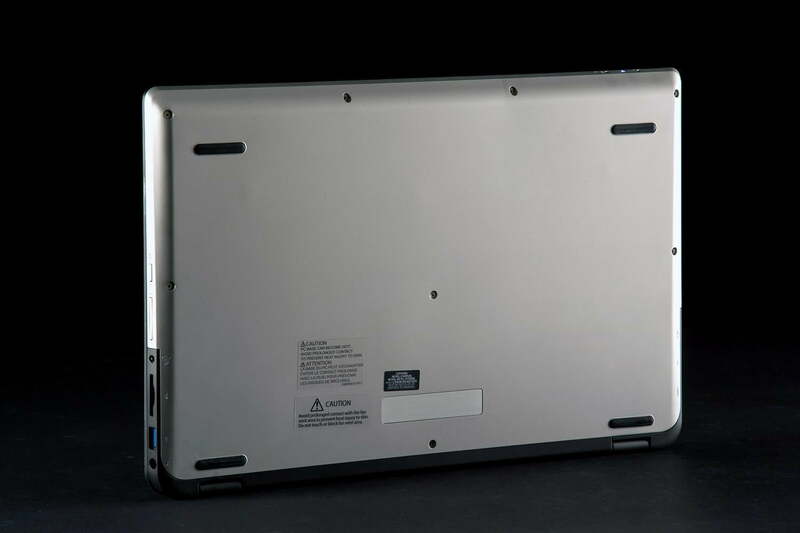 There’s nothing about the Satellite Radius P55W that reveals its true nature at first glance. 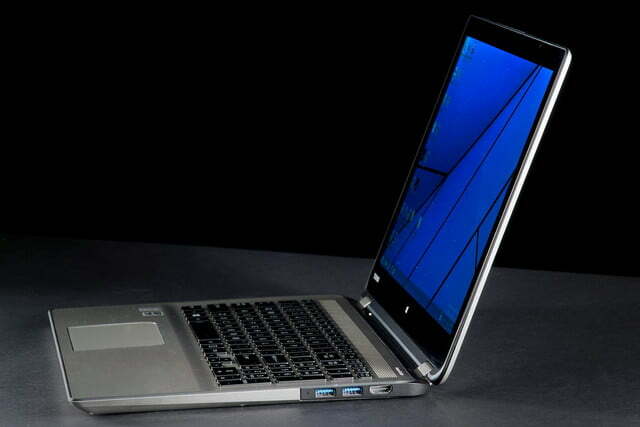 From every angle, it looks like just another Ultrabook. Most users would never guess that the system can transform into a tablet if it weren’t for an instructional sticker located just below the keyboard. This subtle approach is appreciated, and makes sense in a 15.6-inch convertible. 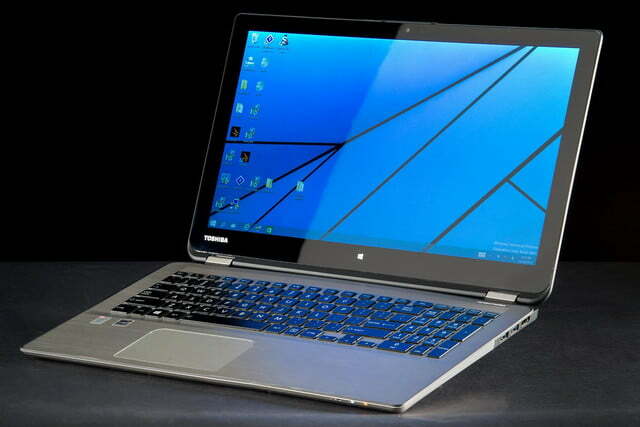 While it’s capable of tablet use, buyers shopping for such a large 2-in-1 likely consider notebook features a priority. An average user could spend years with the P55W without folding it into a tablet and never feel like he’s missing out. Unfortunately, folding the 360-degree hinge reveals a few problems. The most obvious is the sheer size of the device. Holding a hefty 15.6-inch display aloft while visiting websites or watching videos is far from an ideal experience. Some of the other modes like Presentation (which effectively turns the keyboard into a stand for the display) make more sense. However, the Radius never lets you forget that it’s a big, heavy notebook. The display’s image quality is solid overall, but users must put up with slim viewing angles. Ergonomic issues are present as well. 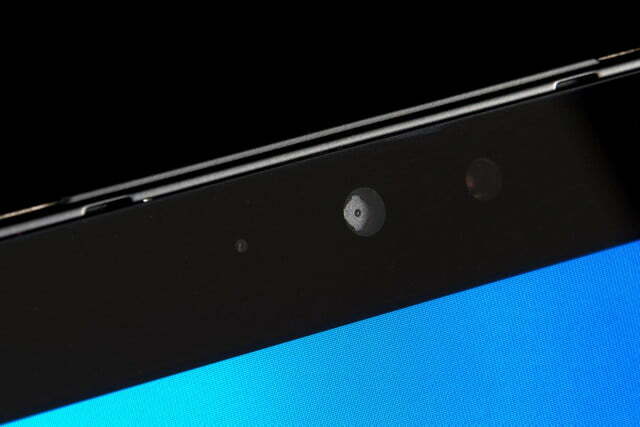 The power button is too easy to accidentally trigger when in tablet mode, the keyboard is uncovered (but disabled) when the system is folded over, and the vents blow hot air over the user’s hands when the tablet is used in portrait mode. 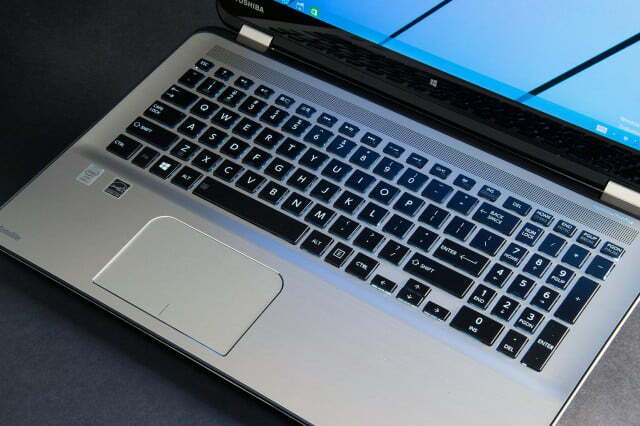 Connectivity options are good though, which once again points to Toshiba’s focus on notebook use. 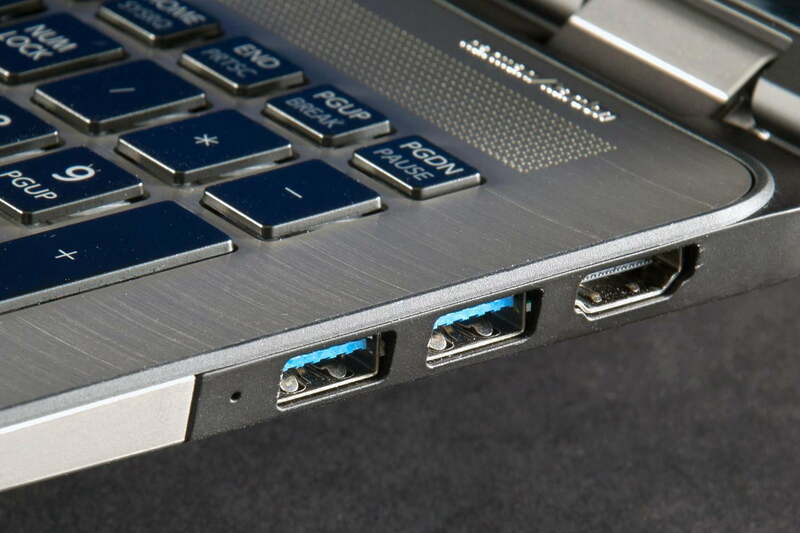 There’s a total of three USB 3.0 ports. Similar devices average two, which is sometimes accompanied by a single USB 2.0 port. HDMI, a single headphone/microphone combo jack, and an SD card reader are available as well. However, an Ethernet jack is not included, so users will have to rely on 802.11ac Wi-Fi and Bluetooth. The Radius provides a roomy keyboard that includes a numpad, which is rare among 2-in-1 computers. The layout is sensible, with good space between keys, though some including backspace and function are a bit undersized. All of the space is spoiled, however, by poor key feel. Each keystroke simultaneously feels stiff and squishy, with a vague bottoming action. Extremely quick touch-typing resulted in quite a few unregistered strokes. This usually happens because a key feels fully activated when, in fact, it’s not. 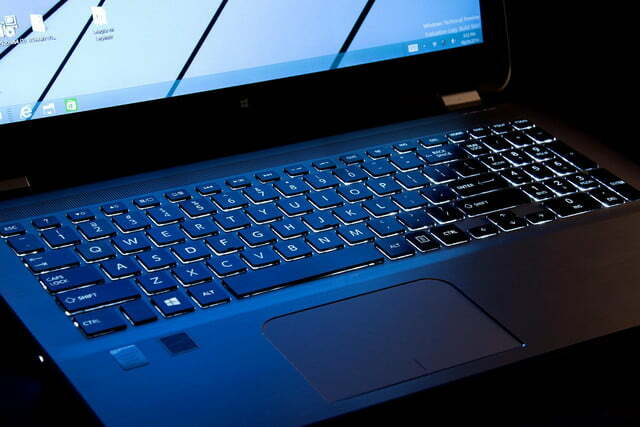 Keyboard backlighting is standard on the Radius. Two brightness settings are available, but only the dimmer of the pair is comfortable to use in a pitch-black room. We noticed some light leak along the bottoms of the ESC, PGDN, and arrow keys. The spacious touchpad measures almost 4 inches wide and about 2 inches deep. We were pleased with its responsiveness, and we didn’t experience unintended click or gesture activation during our time with the Radius. 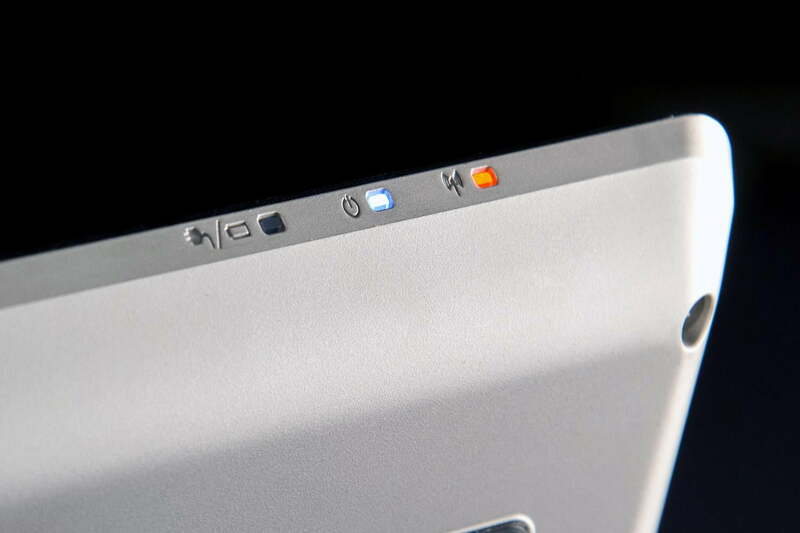 The left/right mouse buttons are integrated into the surface, and lack travel, but ultimately get the job done. Our review unit shipped with a 1080p touchscreen that supports up to 10 simultaneous points of contact. The display’s image quality is solid overall, but users must put up with slim viewing angles. In objective testing, we found that the Satellite Radius P55W puts out a maximum of 196.5 lux while maintaining a respectable contrast ratio of 560:1. That’s quite a bit less than the Lenovo Yoga 2 13’s outstanding result of 850:1, but it’s competitive with most units in this class. The attractive display is paired with a surprisingly strong set of speakers. Color gamut came in at 90 percent of sRGB, and 70 percent of AdobeRGB. 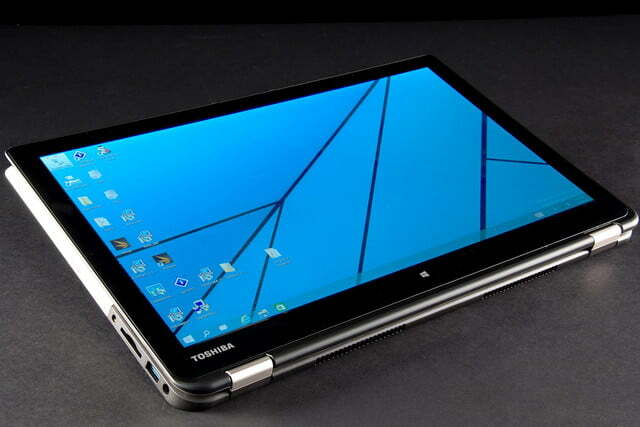 Here, the Toshiba is closer to Lenovo’s smaller 2-in-1, which hit 95 percent of sRGB. The Radius also beats the Acer Switch 10, and Lenovo Flex 2. Display performance was let down by a gamma result of 1.9, however. That’s much lighter than the target of 2.2, and it creates a washed out look in dark content. The attractive display is paired with a surprisingly strong set of speakers. Audio is clear, crisp, and loud at maximum volume. There’s minimal distortion, and even a hint of bass. This makes movies, games, and music more enjoyable. An average buyer will hear no reason to purchase external speakers. The Satellite Radius P55W is available in several different configurations. While base models have an Intel Core i5 chip in them, our decked-out review unit arrived with a 2GHz Core i7-4510U dual-core CPU and 8GB of RAM. This combination proved potent in SiSoft Sandra’s Processor Arithmetic benchmark. Not much room to argue, is there? 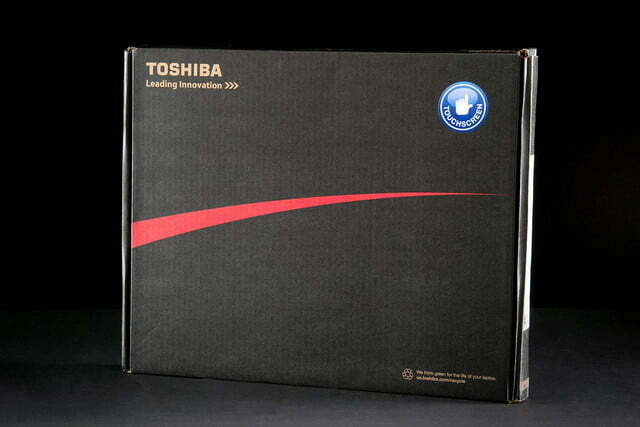 Toshiba’s powerful 2-in-1 easily crushes the competition here with its score of 46.3 GOPs. The Flex 2’s score of 40.54 is close, but it ultimately can’t catch up. The Radius isn’t just powerful compared to other convertibles. It’s the fastest dual-core notebook we’ve reviewed this year. 7-Zip’s file compression test told a similar story with its score of 8,051. That result easily bests the Flex 2 15’s score of 7,188, and the Yoga 2 13’s grade of 6,042. The tiny Acer Switch 10 scored only 4,754. We couldn’t get Geekbench, another CPU test, to run on the Satellite. The program crashed every time we tried to run it. Unfortunately, the fast processor is paired with a sluggish 1TB mechanical hard drive. HDTune found that the drive can manage a read speed of just 44.9 megabytes per second, which is the lowest score we’ve seen this year. At 22 milliseconds, access time is high too. Most mechanical drives can manage at least 60MBps, and some can exceed 100MBps. Therefore, this is a particularly poor showing. The drive’s sluggishness is easy to notice in load screens and file transfers. Graphics performance is also an area of concern. Intel’s mighty Core i7-4510U chip is paired with an Intel HD Graphics 4400 GPU, which is one of the company’s slowest options. It turned in a 3DMark Cloud Gate score of 4,549, and a Fire Strike grade of only 650. As you can see in the above graph, most convertibles fare no better. A standard notebook is the better choice for gaming. Some affordable models, like Acer’s Aspire E5, offer significantly better 3D performance for hundreds less than what the Radius goes for. We wrapped up our benchmark tests with League of Legends, a hugely popular free-to-play game that runs well on most systems. At the Toshiba’s native 1080p resolution, the game averaged 40 frames per second, with a maximum of 53, and a minimum of 16. Visuals were set to Medium. Boosting detail to Very High decreased the average to a nearly-unplayable 20 FPS, with a maximum of 29 and a minimum of 11. The Radius can handle League of Legends in a pinch, but it’s clearly not built for gaming. Owners of the Satellite Radius P55W must put up with nearly 5 pounds of heft. There are heavier laptops out there, to be sure, but we thought Toshiba might have tried harder to lighten the load in this system because it’s a 2-in-1. Obviously that didn’t turn out to be the case, so toting this notebook around can be a chore. Owners of the Satellite Radius P55W must put up with nearly 5 pounds of heft. Battery life is mediocre. We recorded 5 hours and 10 minutes of endurance in the Peacekeeper Web browsing benchmark. That falls well short of the 8 hours stated on this unit’s product page. This is so short, in fact, that we re-tested several times. Each time, we received endurance scores that were a few minutes shorter. To be fair, this isn’t much worse than the Lenovo Yoga 2 13, which offered 5 hours and 29 minutes in our tests. But it’s significantly worse than category leaders like the HP Spectre x2 and the Acer Aspire Switch 10, both of which crack the 6-hour mark. Toshiba did try to provide great endurance, as the Radius has a large battery in it, but it’s ultimately weighed down by the hardware. The notebook needs up to 13.4 watts of juice at idle, and as much as 41.5 watts at full load. The Lenovo Flex 2 15, by comparison, eats roughly the same at idle, but needs only 31 watts at load. High power draw leads to a problem with heat as well. At idle, the system’s maximum external temperature was a modest 82.1 degrees Fahrenheit, but load increased that figure to 98.7 degrees. At load, that’s several degrees warmer than the Lenovo Flex 2 15, and the Acer Aspire Switch 10. Lenovo’s Yoga 2 13 hit a blazing 111.2, however. The fan works hard to keep temperatures from getting out of hand. At idle, the Satellite Radius P55W produces 40.7 decibels of fan noise, which rises to 46.3dB at load. That’s a bit louder than the Lenovo Flex 2 15, which hit 43.1dB. The tiny Acer Aspire Switch 10 is passively cooled, and emits no noise at all. The Toshiba Satellite Radius P55W-B5224 tries very hard to avoid compromise. It’s simultaneously a 2-in-1 and an extremely powerful PC that offers the best processor performance we’ve seen from a dual-core notebook this year. 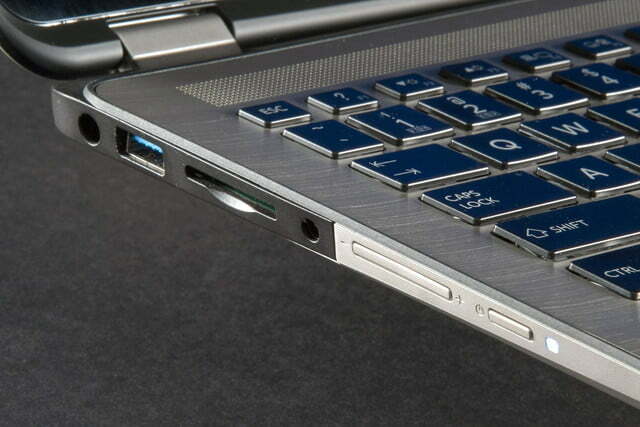 The system also has a good selection of USB ports, a large keyboard, and excellent speakers as well. Combining power with portability is tough though, and doing so creates problems here. Most of these are at the expense of tablet and mobile use. The 15.6-inch Radius is too heavy to hold comfortably when in tablet mode and suffers from poor ergonomic choices to boot. Also, battery life is average at best. While the 1080p touchscreen offers accurate colors, it’s plagued by extremely narrow viewing angles. 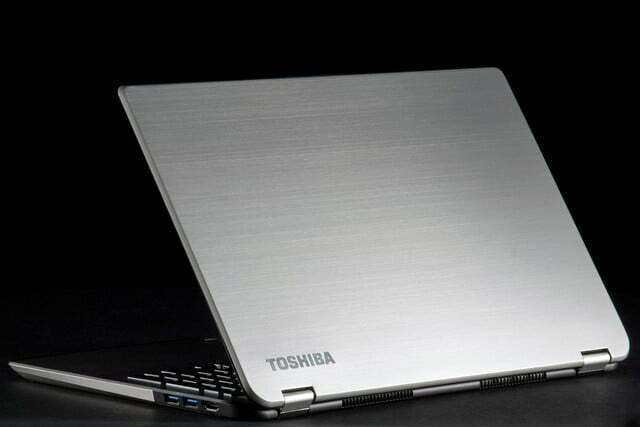 Toshiba also saddles this notebook with a frustratingly slow 1TB mechanical drive. We understand that solid state drives are expensive, and it’s likely that the Radius P55W-B5224 would sell for significantly more than $1,050 if equipped with one. However, the mechanical drive in our review unit was substantially slower than other hard drives we’ve tested. The fast Core i7 dual-core CPU was often held back by the slow drive. 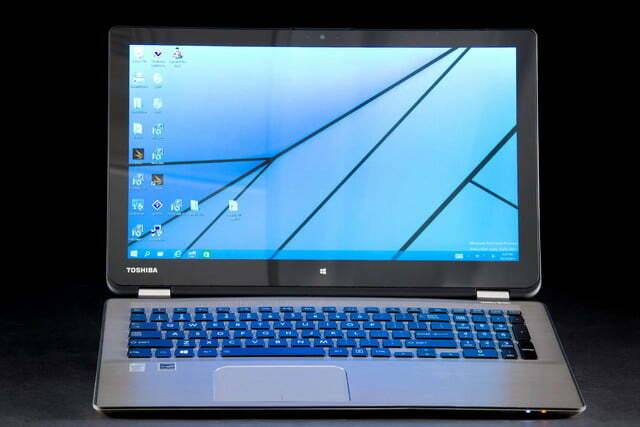 Simply put, the Radius is too heavy for tablet use, too unbalanced as a notebook, and ultimately too expensive. An Acer Aspire E5 notebook, for example, offers solid performance (and better battery life) for around $600, leaving you with $300 to spend on an iPad Mini or an Android tablet. Try as it might, the Radius isn’t a sensible choice overall.